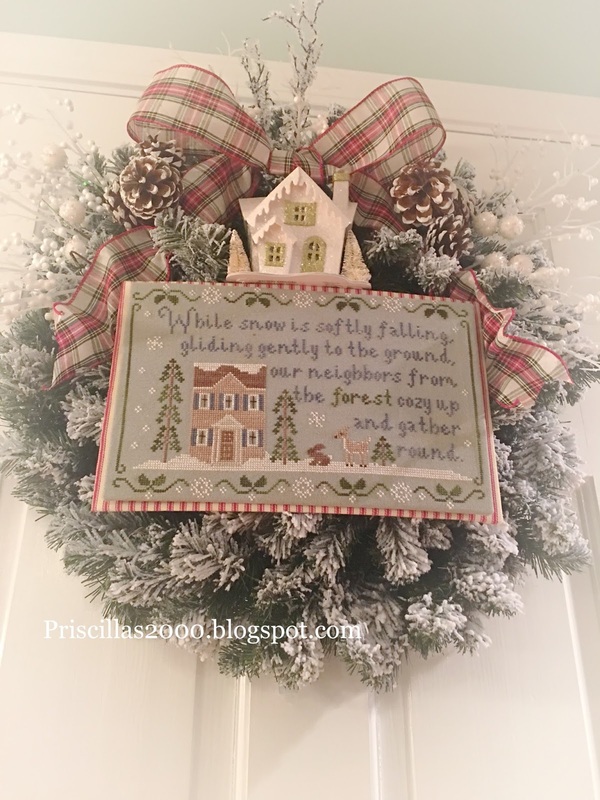 I have had a busy week taking down Christmas and getting the winter decor out.. 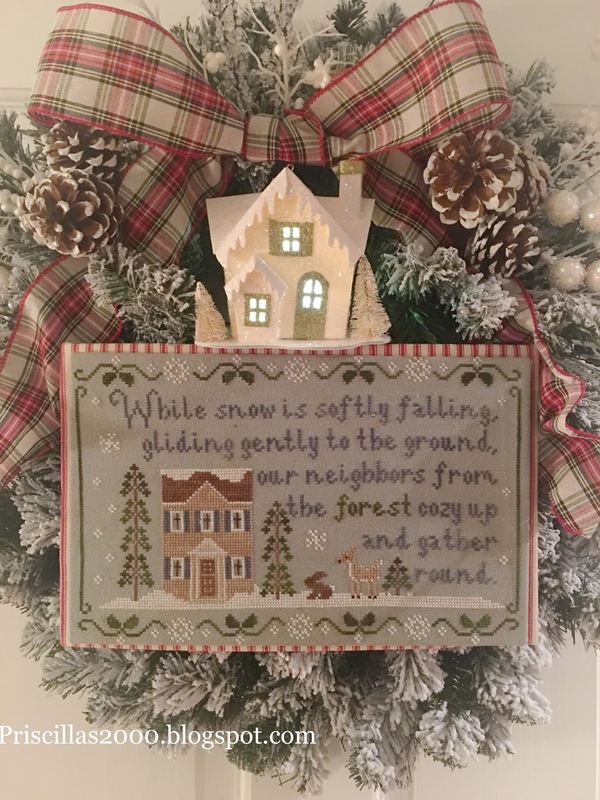 I did manage to finish this Forest Snowfall from Country Cottage Needleworks yesterday! I had this flocked wreath hanging on my basement door after I took down the Christmas wreath and decided it was the perfect place for the Forest Snowfall piece! This was a stitchalong with Chelsea and I that started on December 28.. It was a fun, fast and pretty piece to stitch! I mounted it on sticky board.. and then mounted a piece of red ticking on sticky board.. glued those 2 pieces together and then glued a long piece of ribbon on the back to tie it to the wreath .. Much easier than gluing.. I wanted the red since I love blue and red together for winter..It is stitched on 28 count light blue evenweave that I tea / coffee dyed.. 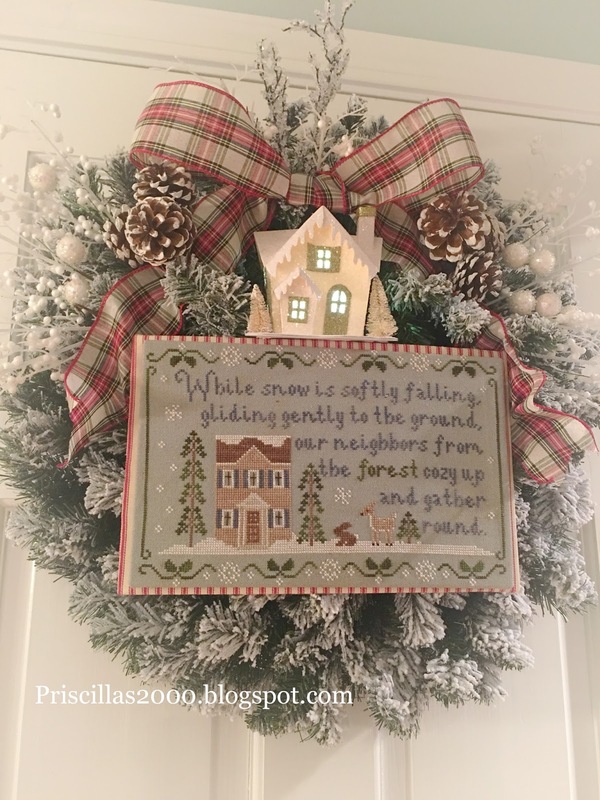 I added a little battery opperated glitter house to the top with lots of white snowy looking picks.. a couple of pinecone pics and red plaid ribbon..It is so pretty and looks like the perfect winter wreath! Another beautiful creation... I haven't finished my Forest Snowfall yet. I'm thinking that I'll put it on an easel in a tablescape. My usual thanks for all of your sharing of ideas. I am always inspired. Very pretty finish! At the rate I'm going, it will be next winter before I finish Forest Snowfall! Another amazing finish, I have this on my list but I need to do some Valentine's day. I hope to do a box of little pillows. 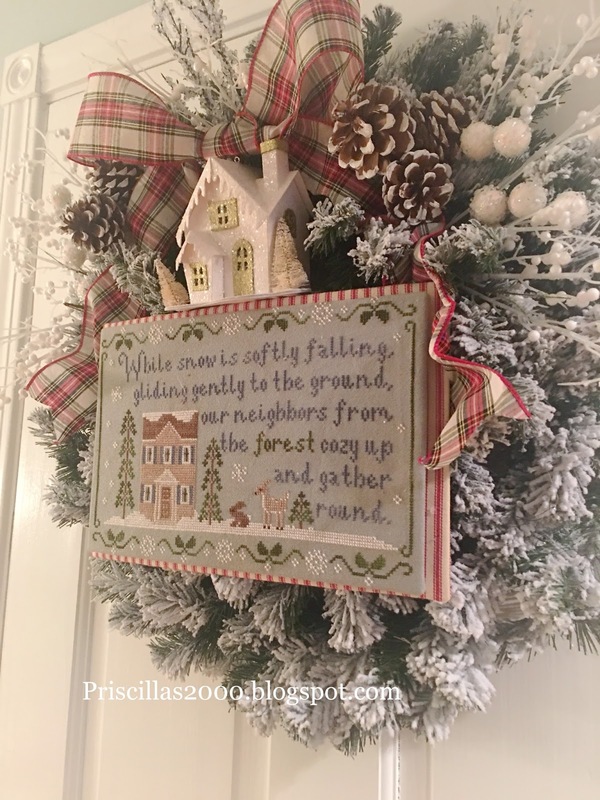 I absolutely LOVE this finish, Priscilla--what a wonderfully creative mind you have :) The little lit-up house makes a perfect accent! We Made Flannel Rag Quilts!